I'm happy that you found my homepage and hope you will have some fun with the pages. The picture should give you a first impression of me. My name is GERHARD BATZ, born on November 20, 1950 at Forchheim, I'm married and have one daughter and two sons. I studied social sciences and I'm working in Marketing and Market Research already for years. You will find something about my interests and hobbies by clicking on the things I like. On this site there are also some links to further interesting websites. 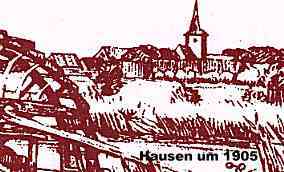 I think that also Hausen's legend of Pontius Pilatus could give you some interesting insights toward the history of this little town. This legend says that Pontius Pilate, who codemned Jesus Christ to death, is born in Hausen. I'm a passionated stamp collector and want to give some pleasure to all stamp collectors who reached this page. I particularly collect all stamps from the areas of the former Czechoslovakia. For everyone who has the same hobby I maintain a meeting point which contents a lot of information about Czechoslovak stamps. Most of the stamps have been designed or engraved by famous artists of the country. So I created a topical collection with stamp of these artists. Some example of this collection I have published in the web. By clicking here you will reach the starting site of may stamp show about Czech and Slovak Stamp Artists. From this title page you have the choice to go to the German, English or Czech part of the gallery. Once again thank you for visiting my homepage. If you enjoyed it, please come back again. If you want to contact me, please write an e-mail or enter my guest book. Because of vandalism the guestbook is temporarily closed. I hope for your understanding. Thank you!